This unusual but easily accessible view of the Newport Lift Bridge shows it in its new paint scheme. Note the cables that run down to the central section of the bridge, which once upon a time could be lifted, and also the huge balance weights on the opposite sides of each tower. The more recent A19 road bridge can be seen in the background. Also is a gas holder belonging to Newport Gasworks in the middle foreground. The gasworks is long gone and the gas holder itself is not long for this world. But from where was this picture taken? This entry was posted in River, Bridges, Ships and Boats by Picture Stockton Team. Bookmark the permalink. The lift is on the Transporter, not the Newport Bridge. The lift was installed about three years back, and is there to take people to the walkway to see the view and enjoy bungy jumping. The stairs on the Haverton Hill side are closed off permanently. Frank Mee may be rather nonplussed to learn that the lift was made in the Czech Republic. This is one reason why there was such a long wait for spare parts, keeping the lift out of action. But just wait until Brexit! This has me puzzled, I thought the lift was installed on the Transporter Bridge not the Newport Bridge. As to buying abroad it must be for cost as we have plenty of lift companies in this country, we installed British lifts at ICI. There is a bridge in Canada the same as this, it is on the road to Niagara Falls, but it looks a earlier version. Correct Anon, built in 1904. There are many Vertical Lift Bridges in the USA of varying types, the Newport was built as a lift bridge because Stockton was still quite a busy port, it was the first in the UK as I said in my short history of walking over the bridge many times as a lad. The Bridge is part of our heritage built here from steel made here when the area was one of the best engineering districts in the UK. The Tees still has good industrial roots only without the smoke dust and manual labour it once took. Reading the local news media there is plenty to cheer about as the new replaces the old and outdated. Can you imagine todays youth swinging a 14 pound hammer for hours swaging steel plates for riveting or using belt driven punch drills and shears, 8 men lifting a plate and the guide shearer shouting up down over the noise of the machine, riveting guns, chippers and the general melee of a boiler shop as we did, I doubt it. The viewpoint is in fact the Transporter Bridge wallkway. The clue was in the words “easily accessible”. The picture was taken on Sunday morning, 15th July 2018, when 50 members of the Newcomen Society for the Study of Industrial History made a visit. The lift to the walkway had only been opened the previous Thursday, having been out of action for a few months. Some spare parts for the lift mechanism had taken a long time to come through the system, The actual refitting did not take much time at all. I didn’t realise there was a lift,as teenagers in the 50’s weused to get the bus from Stockton climb all the stairs to the walkway go across then bus or walk back to Stockton.We normally walked or cycled everywhere as no one had a car where we lived in Parkfield.It kept us all slim and fit.I seem to remember it was 6d to walk across. Maybe photographed from somewhere on the Transporter bridge? Photo taken from the Transporter Bridge. See “View of Stockton from the Transporter”, 3 May 2017, bottom left of photo. Could it have been taken from a drone? Hi Fred, I reckon you were on a visit to the Transporter Bridge, and took your photo from the high level walkway, at the Middlesbrough end. I have a photo that’s from almost exactly the same spot!, only without any zoom. Well done for excluding all of the bridge’s bright blue steel-work from the photo, that would of instantly given the game away 🙂 On a clear day it’s a good view from up there. The paint job makes the bridge look well. Such a pity that it cant be raised anymore. I remember when Stockton still had a port when it would be lifted 2 or 3 times a week. Great picture of an iconic structure, possibly taken from somewhere like the ICI Nitram Tower. 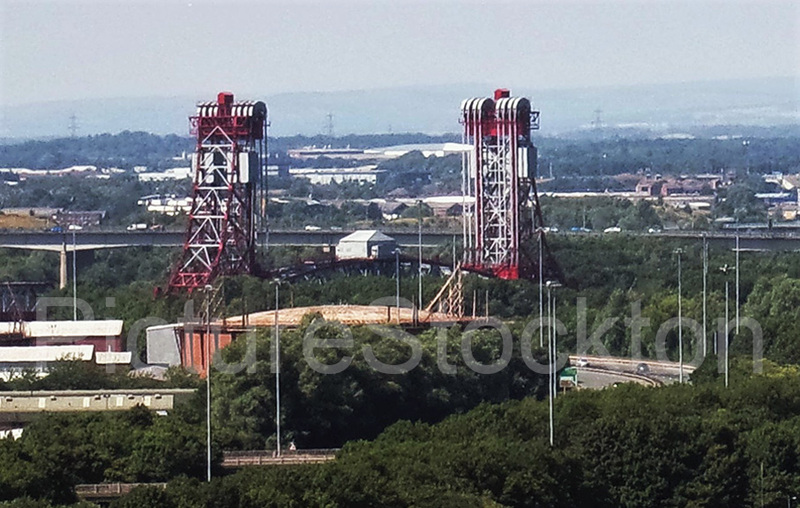 Photo was either taken from the Transporter Bridge or an inbound flight to Teesside Airport . A very low one ! The first Vertical lift Bridge in the UK built by Dorman Long, opened in 1934. Walking from Norton Green up the High Street, South Road across the Farm now the Prison Mother and I crossed that bridge many times sometimes seeing it open and boats passing as we went to my Grandmothers house in North Ormesby. We got the bus on the Stockton road as by then I would be moaning about the long walk, Mother could walk for miles. The story is it opened twice a day well I saw it open more times than that, the gates would close to stop the traffic then the bridge would start to move up, it never failed to entrance me and working out how it worked. Obviously if the balance weights were correctly set it would take very little power to move it up and down. At that time we got a lot of wood carrying sailing ships from Scandinavia, you would see the masts sail by above the road level although they must have had an engine as well. Stockton was quite a busy port prewar and after for a while with imports of grain to and from the many Mills the last exports being scrap steel before the Riverside was remodelled and cleaned up. Change happens, Yarm had been the main port when Middlesbrough was a tiny village in a marsh then Stockton became the main port until Middlebrough became a boom town and the main port. The lift bridge became redundant though at least they did not knock it down, a monument to the Steel makers of the River Tees and our Engineering Heritage.